Stephen Meakins was not only our accompanist, but a regular concert performer with the choir, accompanying not only concerts and CD recordings, but also giving memorable solo performances in our concerts. In this capacity we remember his rendition of Britten’s Young Apollo for piano and orchestra, and also a sequence of Rachmaninov’s demanding solo piano works which were cleverly woven into our performance of Rachmaninov’s Vespers. He is one of the UK’s busiest young accompanists, and held Organ Scholarships at All Saints Northampton, St Paul’s Cathedral, Melbourne (Australia), and whilst at the Royal College of Music he was awarded the accompanist prize in the Kathleen Ferrier Competition for Young Singers. 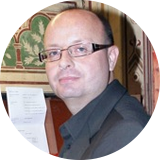 David Cowen is both Organist and Director of Music at Leicester’s Dominican Priory and Associate Organist at Leicester Cathedral. 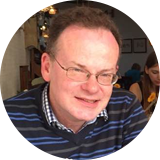 He is also an Individual Music Teacher at Loughborough Endowed Schools Music School and works regularly with Leicestershire Chorale. 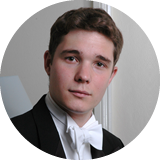 David was an organ scholar at the University of Oxford and studied privately in Paris with Sophie-Véronique Cauchefer-Choplin, specialising in improvisation. 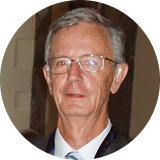 He is a Fellow of the Royal College of Organists and holds the Certificat d’aptitude d’Artiste Musicien of the Diocese of Paris. John Byron is active as a conductor, pianist, composer and teacher. His concerto repertoire is substantial, and he has performed with Milton Keynes City Orchestra and numerous local organisations. John has composed several large-scale works involving chorus, soloists and orchestra including Three English Lyrics (Milton Keynes Chorale and Milton Keynes City Orchestra). 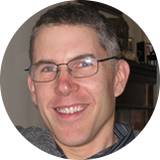 Mark Pescott continues to live in Kettering and teach piano at Northampton School for Boys and Brooke Weston Academy in Corby. He is Assistant Director of Music at the church of Ss Peter and Paul, Kettering, and regularly works as repetiteur for the Royal Academy of Dance in London and the Birmingham Royal Ballet Company. In 2011 he was the organist for Earl Spencer's Wedding at Althorp House, and for the Duchess of Buccleuch & Queensberry's memorial service. 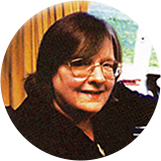 Jane Humfrey (1937 - 2012) is remembered by the choir for her pianistic skills and musicianship as our accompanist. She was also well known locally as a music teacher and composer. Although Jane was a quiet, unassuming lady, never seeking the limelight, we were delighted to discover her hidden poetic talents at occasional choir social evenings when she could be guaranteed to “bring the house down”. This would usually take the form of one of her humorous monologues, appropriately worded to suit the occasion and gathered company, and always delivered with wry aplomb from memory. The choir dedicated their December 2013 concert to her memory, a concert which included three works by a composer she loved, Benjamin Britten. David Wright, who had been a bass in the choir for several years, stepped into the breach as rehearsal accompanist on the retirement of Charles Barker. For three years he worked with Michael Nicholas and remembers well accompanying carol concerts in Northampton’s Guildhall and pulling out stops of the organ in St Matthew’s Church for Gillian Weir’s performance of Poulenc’s Gloria and the Organ Concerto. 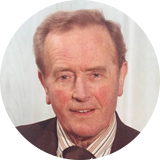 He was later a member of Edinburgh Bach Choir, Tonbridge Philharmonic Society, and Bristol Choral Society. David is also a pastoral minister in the Baptist Church. Charles Barker (1904 - 1986) was for many years, in addition to repetiteur for the Northampton Bach Choir, Assistant Organist at St Matthew's Church, and he is principally remembered as the organist in the first performance of Benjamin Britten's "Rejoice in the Lamb" (1943), under the direction of the composer, who was himself wearing choir robes.